Thanks for sharing, good job. 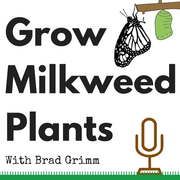 This will really help more people plant milkweed. Kamaile, I think getting the seed to START growing is the hardest part. Water germination should give you the best results. Water germination is also the fastest way to start the seed so it's a win win. I haven't tested water germination with swamp milkweed but it has worked so well with other kinds of milkweed that I think you will have good results. Let me know how it goes. Let me know if you have any additional questions as you are going thru the process. -Brad G.
Hi Brad, My question pertains to the caterpillars. I planted one Native Milk Weed plant. Within a short time I had 3 caterpillars. I now have around 25 caterpillars. They have eaten all the leaves. Will they move on to another type of plant to feed or are they going to starve? I want to plant more plants but can't find any around here. What do I do to save them? Hi Ann. I'll assume the caterpillars are monarchs (milkweed tussock moth caterpillars also eat milkweed). Monarchs are a specialist eater and only eat milkweed plants. There are many kinds of milkweed in MS. Unfortunately I don't know of any local sources for plants to solve the problem. If you can identify milkweed then maybe you can find some in a roadside ditch, field or near a stream. Picking a few leaves would be perfect. https://www.growmilkweedplants.com/mississippi.html Caterpillars sure grow up fast. You may need as many as five plants to feed twenty-five caterpillars. Thank you for growing milkweed Ann. Thanks Brad. Yes, my caterpillars are Monarchs. Since I couldn't find any wild Milk Weed around here, the caterpillars have moved on. Live and learn I guess. I will be planting more plants for next year in a corner of our yard. I really want to help the Monarch population thrive. Day 4 and I have germinating milkweeds! Thanks for your help!